ummm...i don't recognize what type car that is. I think that's his Yata. Not mine, his. Gosh I haven't posted here in ages but this thread caught my attention. I won't go into details but some serious stuff going on in my life made me finally do some things I wouldn't normally do, fun things. This is one of them Aquired this back in June, the second picture is of the one I had when I was 22. 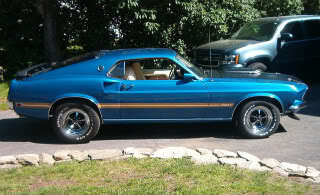 69 Mach I, 4 barrel 351 Windsor, 4 speed, everything is original except the radio. Acapulco Blue/white interior. 69 Fast Back 302, 3 speed, Gulfstream Aqua/black interior. Like all cars of that era that were driven every day it rusted out from under me. now that's a color i've never seen on a Stang. beautiful! my mom's 69 rusted out terribly - first thing to go was the front quarter panels and the floors behind the bucket seats. following right along was the rear quarter panels and trunk. the rag top lasted longer than the metal body. true story...i had the car in San Diego and was going thru a causeway toll booth. the toll collector took one look at the rusted out car (think Swiss cheese) and said..."I hope it's not in a lot of pain". Here is my 73 Porsche 911. I got it cheap, but it was a project. But whats a ER guy to do over the winter? I don't know much about Mustangs, but I did know enough to buy a storage building full of 69 and 70 mustang parts. I finally got rid of everything. The first thing I sold was a dash with a tach in it and that covered my investment. now there's a smart man! And I made enough off the Mustang parts to pay for my 911. And I sold everything cheap. There were big block heads, trans, hoods, ect. Looked like around 3 cars were parted out. Its a Mazda Miata ,lotsa fun,its like driving a gokart,it'll go around corners like its on rails.I've always liked them so when i decided to give up motorcycling i bought this one. oh, ok. looks like a great fun car to drive. i didn't want to take the bait on the other post... "I think that's his Yata. Not mine, his. " cuz i had no idea what a Yata was and i wanted to stay, um, "uninformed". "The Cars We Drove in the 50s and 60s"
just a smidge before my time...but i have seen some of these cars in shows and in antique car caravans running down the NYS Thruway.